OSWEGO, NY – Mitchell’s Speedway Press celebrates its 85th anniversary in 2015. It kicks off its 85th year with support of Oswego Speedway racing and once again is a race night co-partner in 2015. W.P. Mitchell Printing was founded in the family basement at 166 E. Fourth St., in 1930. Its founder, Weir Pulver Mitchell, worked against great odds, having been stricken with spinal meningitis at age 16, and after a long recovery, was rendered deaf. Not one to be deterred, he attended the Rochester Mechanics school for printing, today known as National Technical Institute for the Deaf: RIT. His first job was working for the Mexico Independent in Mexico NY, while living upstairs at Beck’s Hotel. 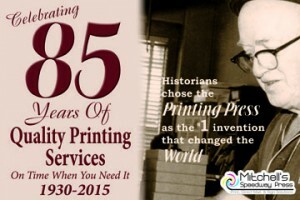 Homesick, he moved back to Oswego and founded, at 19 years old, the printing company we operate today. This first commercial location was in the basement of Vona’s Shoes until 1940, when he purchased and moved to 117 W. First St., Oswego. Starting a business at that time was (what many would consider) not a wise move in the Depression and World War II beginning. But working day and night, he was able to make ends meet. His general attitude to both life and the printing business was positive and characterized by a unique pioneering spirit. Weir worked persistently, and was up every day before 6 am, and almost never failed to have lunch with his wife, Mary (Slanski). He raised his daughter Helen, with the same entrepreneurial spirit, and she worked with him for more than 40 years until her retirement. Her son, John Mitchell Henry, was brought up in the printing company, and watched his mother and grandfather build a business that he was one day to run. From a young age, John helped everywhere in the company, from counting coins to delivering printing. In 1979, after graduating from Oswego High School, John attended his grandfather’s alma mater, RIT for print management and was made partner in 1983. It was John who made the third of four moves of the firm, from 117 W. First St., when the city of Oswego purchased the property to build the current senior living apartments, over to 127 E. First St. The family business expanded, and John purchased the rest of the company at his grandfather’s passing. He continued working in the spirit of his grandfather: Developing and designing unique products solving the printing, promotional and signage needs of his customers, with the focus always on quality, honesty, and value, just as Weir taught him. Over the years, the whole family has been involved with John’s wife, Kathy (Randall) Henry, who directs sales and all account management, to both their kids (Megan and Tyler) who have grown up working after school and vacations in the shop. At the end of 2008, it became clear that the company had outgrown its First Street location. At that time, Speedway Press owners Doug and George Caruso were ready to retire. A call was made, and Mitchell’s Speedway Press and our 4th location was born at 1 Burkle St.
“Today, we thrive in the competitive world of printing by investing and expanding in areas such as our new large format signage area,” John said. John also has co-founded a national printing Association (NPOA) with 19 others; he currently is serving on the board as director of events and programs; countinuing to take pride in increasing efficiency and satisfaction in companies he serves. A fourth generation is nearby, with son, Tyler Henry, helping out as needed, as John helped his grandfather many years ago. Today, we proudly carry on the legacy handed to us by the Carusos in the weekly production of The Oswego Eagle, where you will still find George Caruso and Carol Demling Haynes writing, editing and producing this legendary program. Mitchell’s Speedway Press also continues the tradition of producing weekly programs and racing material for race tracks throughout the United States and Canada. And, after 85 years, Mr. Henry sees no end in sight. “Our values have never changed, nor has our commitment to providing not just printing, but solid advice, creative solutions and winning customer service,” he said. Congratulations John and Kathy! having known you, worked for you, rented from you it’s been my pleasure to have been a very small part of your history. Continued success for many many years.